ATHENS – Georgia won their second game of the season, but it was far from pretty. The Bulldogs welcomed FCS opponent Nicholls into Sanford Stadium for their home opener. The expectation was for Georgia to run away with the game, as the Bulldogs were 53.5-point favorites and the Colonels finished last season with a 3-9 record which included two abysmal performances against FBS teams. And well, that wasn’t the case as Georgia hung on to barely win 26-24. Georgia opened the scoring early, as running back Nick Chubb had a 6-yard rush for the touchdown. From then on, it was nothing but sloppy. Georgia finished with three turnovers in the win, which placed Nicholls in the red zone on each occurrence, and were able to score 17 points as a result of the Bulldogs’ miscues. The Colonels were led by freshman quarterback Chase Fourcade, who managed the red zone situations well had two touchdown completions. Georgia was truly dominated at the line as well, both offensively and defensively. After rushing for 289 yards against North Carolina, the rushing attack was shutdown against a lesser opponent as the Bulldogs rushing attack totaled for only 151 yards in their two-point victory. The poor rushing numbers could be attributed to the less than stellar performance from Chubb, who mustered 80 yards on 20 carries. Entering Saturday’s action, he had reached the 100-yard mark in fourteen consecutive starts, excluding the Tennessee game in which Chubb only had one carry before sustaining injury. Isaiah McKenzie: The junior wide receiver has been able to truly display his skill set in the first two games to open the season, his performance could have been what saved Georgia from an embarrassing defeat. McKenzie had rushing opportunities, receiving opportunities and chances on the punt return unit as well. He finished with 142 all-purpose yards and a 66-yard receiving touchdown, which was large in part to a block by junior Javon Wims, who saw his first action as a junior college transfer. However, McKenzie did have some miscues on special teams, including a muffed punt as that area shows further need for improvement. 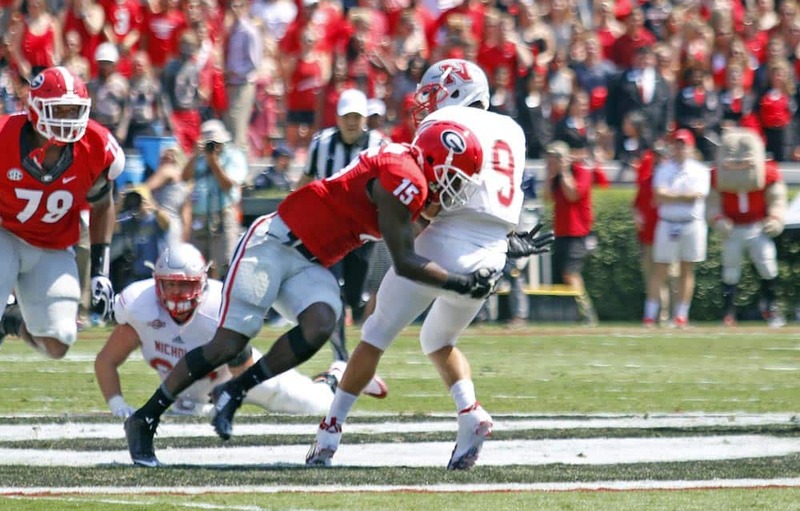 Dominick Sanders: Georgia’s junior leader in the secondary displayed his ball-hawking skills in the Bulldogs victory. In the first half, he nearly had a one-handed interception, however was ruled out of bounds. He was able to redeem himself as he had a crucial interception in the second half. Georgia is depending on Sanders to lead his group, and he showed that capability in the second win of the season. Offensive Line: Georgia head coach Kirby Smart has voiced his concern over the offensive line, and that group showed why on Saturday. They were faced against a defensive line of lesser talent, but they were dominated. The Bulldogs were only able to tally 167 yards on the ground, and didn’t find any success on inside runs. In addition, Eason was under pressure on multiple occasions, being sacked once and not having enough time in the pocket on numerous instances. “It’s important that we understand that our football team has got to get better,” Smart said. “It’s frustrating. A lot of guys didn’t execute, didn’t play well, and that’s my responsibility. We’ve got to improve because there are good teams down the road. … Other schools work on football, too. I’m disappointed we didn’t go out and execute.